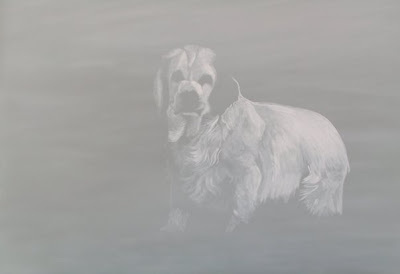 Below is a progression of a commissioned painting of a clumber spaniel named Truman that I am working on... There is still a way to go on this one but progress is being made. The biggest challenge of this piece has been handling all of the "so called" whites. 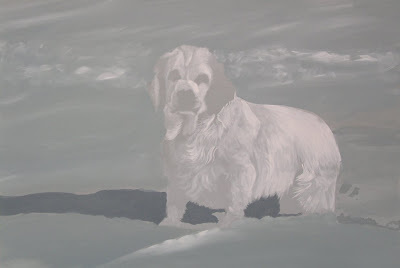 This is a white dog in the snow and it has been eye-opening dealing with all of the different colors and different values. This is definitely one of the more difficult paintings I have worked on so far and I feel like I am being pushed which is always a good thing. 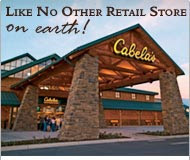 Cabela's is having a grand opening celebration for their new store located in Lacey, Washington and I have been invited to be their guest for the weekend weekend of January 26th & 27th. This promises to be a fun and exciting weekend and I will post more information as the date nears. 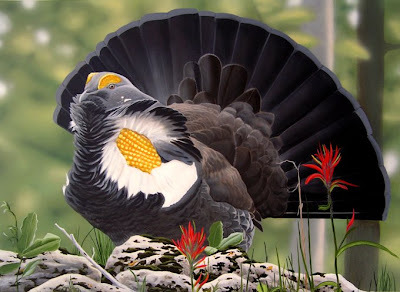 This painting in progress will be for the Oregon Upland Bird Stamp competition. 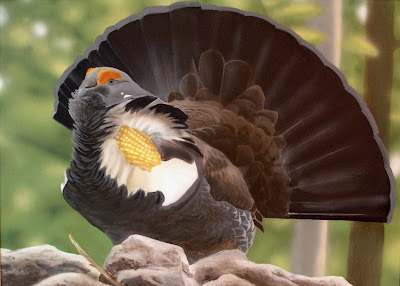 This year's species is the blue grouse. There will be some wildflowers in the foreground that will represent the edge of a mountain meadow. Right now I'm thinking some Indian Paintbrush because of it's red flowers and because they are generally found in the same habitat you might see a blue grouse. 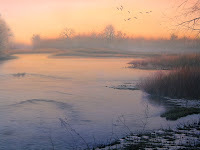 The painting South Platte Sunrise has been selected by Pheasants Forever to be a part of their 2008 National Art Package. 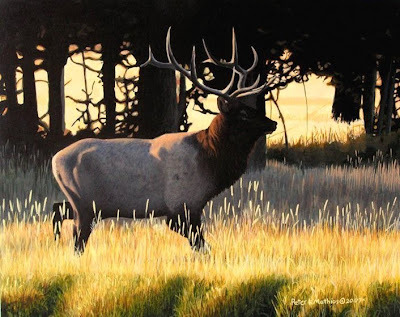 The prints will be available at PF events throughout the country beginning in April and will raise money for upland bird habitat in the United States. Pheasants Forever is dedicated to the conservation of pheasants, quail and other wildlife through habitat improvements, public awareness, education and land management policies and programs. Here is a new painting that I have been working on this week that is a result from the trip out to Ankeny Hill National Wildlife Refuge (mentioned in a post below). I am going for a somewhat different look with a blurred background. 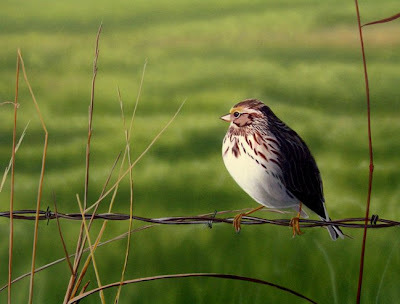 This focuses all the attention on the foreground which emphasizes the detail in the bird, grasses and barbed wire. The annual banquet for Albany DU is Saturday, December 8th at the Linn County Fairgrounds. The dinner features a raffle and an auction with the proceeds benefiting wetlands, waterfowl and the myriad of other wildlife associated with wetlands. Each year I donate artwork to the auction and this year I have donated "Spring Drake"(above). However, the national package print "First Flight"(right) will also be available and possibly an original piece of art as well. Doors open at 5:00pm with a no-host bar. Dinner is at 6:30pm catered by Burton's with the live auction to follow. My artwork will be exhibiting locally in Albany (OR) at Cameron's Gallery and Gifts in the Heritage Mall through January 15th. 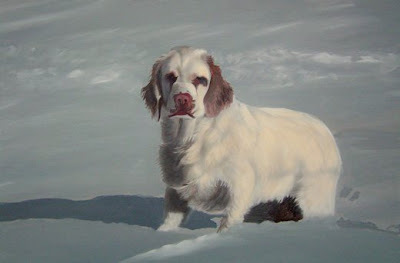 There are original studio paintings and plein air paintings, framed prints, and unframed prints available. For more information you can visit the Heritage Mall website or call 541.967.0564. This healthy bull elk is in the peak of September's rutting season. During this time their haunting bugles can be heard throughout the intermountain west and many other states thanks to conservation efforts from organizations like the Rocky Mountain Elk Foundation. This particular bull was seen in Yellowstone National Park and was moving to challenge another bull for his harem of cows.